Featuring Hedland's unique spring loaded variable area design. EZ-View meters can be installed quickly without costly flow straighteners or other special plumbing requirements. These meters operate within ±5% accuracy and are constructed of Polysulfone plastic. 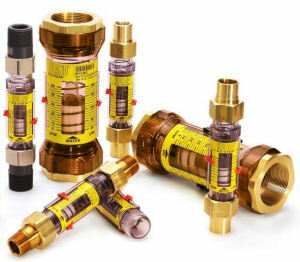 Available port sizes range from 1/2" to 2" with a choice of brass, T303 stainless steel or PVC fittings. Optional Flow-Alert Flow Switch modules automatically signal alarms if flow is too high or too low. The switch options include AC and DC latching switch modules or a reed switch module. ► Available in sizes from 1/2" to 2"